Usually the excuse "nothing is working" is used by finance professionals when begging clients not to pull their money, desperate to explain woeful performance and when there are no other explanations left. Only in 2018, that excuse is absolutely correct. After another abysmal day, in which every single sector in the market closed in the red as stocks tumbled 2%, capping a dreadful two-month stretch since the S&P hit its all time highs exactly two months ago, which has seen both the S&P and the Dow turn red for the year with the Nasdaq just barely holding onto green, while oil crashed 6% slumping to a one year low, junk bonds matched a record streak of losses, the overall market just suffered one of its worst sessions in the past three years. But what is most remarkable is the following chart from Bloomberg which shows the year-to-date return of the best performing asset between US and global equities, corporate bonds, Treasuries, gold and real cash, and according to which 2018 is shaping up as what may be the worst year on record for cross-asset investors. Indeed, nothing at all has worked this year! The inability of any single asset class to escape the dismal black hole supergravity of devastating losses in a brutal post-BTFD catharsis that has mutated into an equal-opportunity rout, crushing returns across all assets, has left investors reeling, shellshocked and paralyzed, and dreading what may come tomorrow let alone next year when both the US economy and corporate earnings are expected to see their supercharged recent growth rates come crashing back down to earth. Meanwhile, amid radiosilence of hope for the bulls as the market breaches one support level after the next, the Federal Reserve shows no sign of easing back on its tightening crusade or delaying the interest rate hikes that have become the source of nightmares for holders of some $5 trillion in corporate bonds that were sold by S&P 500 companies in the past decade, and whose proceeds were largely squandered in the pursuit of stock buybacks and fleeting shareholders gains and higher management compensations. Beneath the turbulent surface of the stormy market, even stronger undercurrents threaten to tear apart what's left of investor optimism. After a decade of outperformance by growth stocks, the sector has seen a historic flight as rotation into the unloved, largely forgotten value sector has emerged on a scale unseen in years. Hedge funds, who hoped that "buy the dip" would work one last time and who rushed into the traditional "safety" of tech stocks at the end of October, were whipsawed, and turned net sellers this month, with the group accounting for the most selling among major industries according to Goldman Sachs. 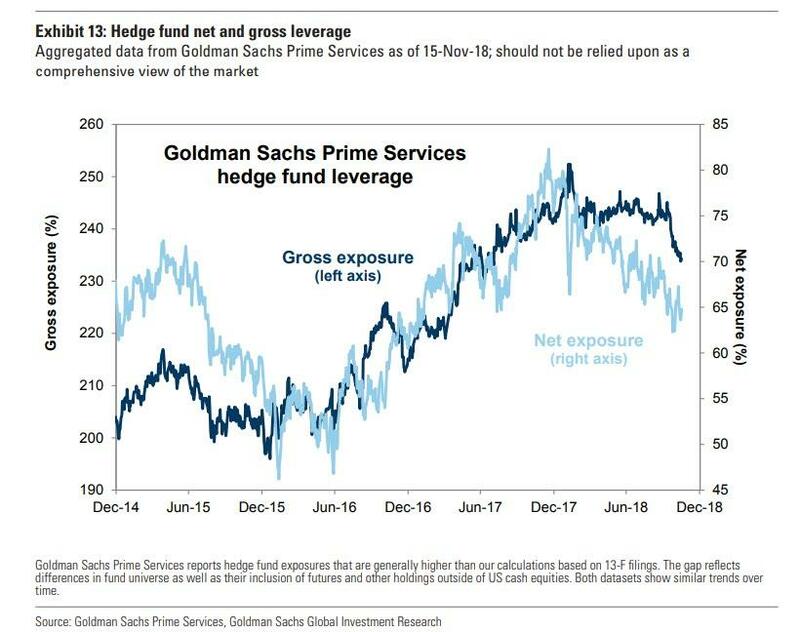 Meanwhile, as if sensing the coming storm, Goldman writes that hedge fund net exposures steadily declined throughout 2018, including during 2Q and 3Q while the broad equity market rallied, leaving most investors in the cold. Net long exposure calculated based on 13-F filings and publicly-available short interest data registered 49% at the start of 4Q, a decline from 56% at the start of 2018, and one of the lowest in years. Every sector in the S&P 500 fell on Tuesday, a day after every member of the 67-company S&P 500 Information Technology Index dropped. Disparate corners of the stock market are seeing reversals, from the tech high-flyers like Apple and Alphabet that led the way up to higher-leverage names that have been trailing for months. But the biggest harbinger of even more sorrow for equities is not even in the stock market, but in bonds. After years of relentless gains in both the investment grade and junk bond space, corporate credit has finally cracked, with both yields and spreads blowing out to multi-year highs. Indeed, after hitting near record tights just over a month ago, investment-grade bonds are on track for their worst year in terms of total returns since 2008 as the Fed continues to raise rates, while high yield spreads have exploded higher. What is perhaps scariest, is that at this moment the US economy is firing on all cylinders; this will change in 2019 and 2020 when Goldman forecasts US GDP will slide below 2.0% and grind to a crawl. Minneapolis Fed President Neel Kashkari, one of the Fed's biggest doves who’s repeatedly called for a stop to raising interest rates, repeated his warning and said further tightening could trigger a recession. “One of my concerns is that if we preemptively raise interest rates, and it’s not in fact necessary, we might be the cause of ending the expansion” and triggering the next recession, Kashkari said in a National Public Radio interview posted online Tuesday. 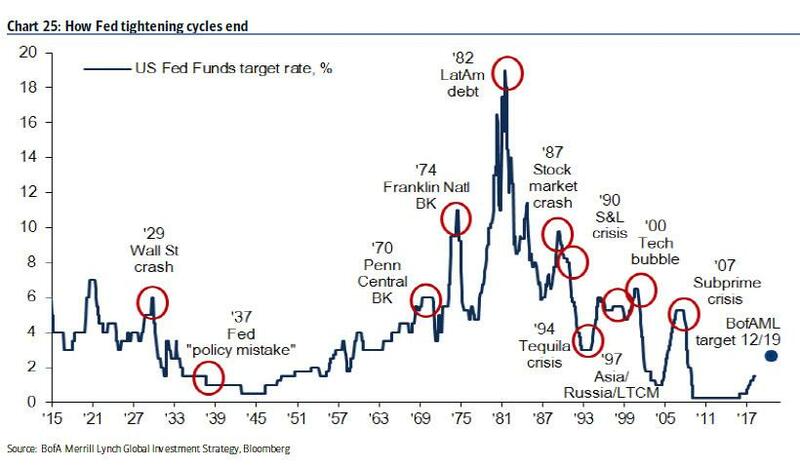 Which, of course, will not come as a surprise to regular readers who know very well that every single Fed tightening - like the one right now - has resulted in a crisis. It won't be different this time.